Gruden's defense is in a world of hurt right now. Their amount of pressures Monday night was only slightly better than the Seahawks, 14.7% vs 12.5% respectively. Keenum was shaky in his first start with the Broncos with 3 INTs but was able to still feed the ball to receivers and get 3 TDs. Then there is the Denver D vs the Raiders O. Unless Keenum is abducted by aliens, Denver has this game. Didn't he say after the game Monday that they need to find their pass rush? Ummm... he's in Chicago!!! He did Couldn't figure why there was none. Carr had a solid game last time. The team overall did. This is one game Mack will be missed because he can force QBs to make mistakes. Bruce Irvin had a good game last time. I expect more than 5 pressures this time around. Maybe 6. The Raiders will do good in a chunk. I don't know if it's an early or late chunk but they'll have an offensive spurt for a period. Denver’s D is very aggressive and will be lured into the big play like the Johnny Holton TD last year, Denver’s run D should keep your backs in check. Kolton Miller vs Chubb & Ray and Penn on the right side vs Von & Shaq. So the Raiders defense allowed 140 yards rushing which kind of book ends with their other issue on defense about pass rushing and suggests their DL is pretty weak. 108 of those yards were to Todd Gurley. There;s is a slight dropoff from Gurley to your combo. Double CP bet for you only: Raiders rush for more yards, win or lose. I'll take that CP bet...I think the Broncos go up early and control the clock. Forcing some turnovers in the second half from Carr and Company. I expect the broncos pass rush wont look nearly as dominant as they did week 1. The Raiders' O line is better than Seattle's, but would expect Carr to be picking himself up off the ground with relative frequency. If this is true, what’s it saying for Marshal and Davis? Where is the MNF intro? It must be posted before every raiders game. Last edited by EddieMac; 09-13-2018 at 09:22 PM. Last edited by EddieMac; 09-13-2018 at 09:26 PM. If Von and Chubb can disrupt Carr early, it will throw him off his game, and he is going to have a miserable day. 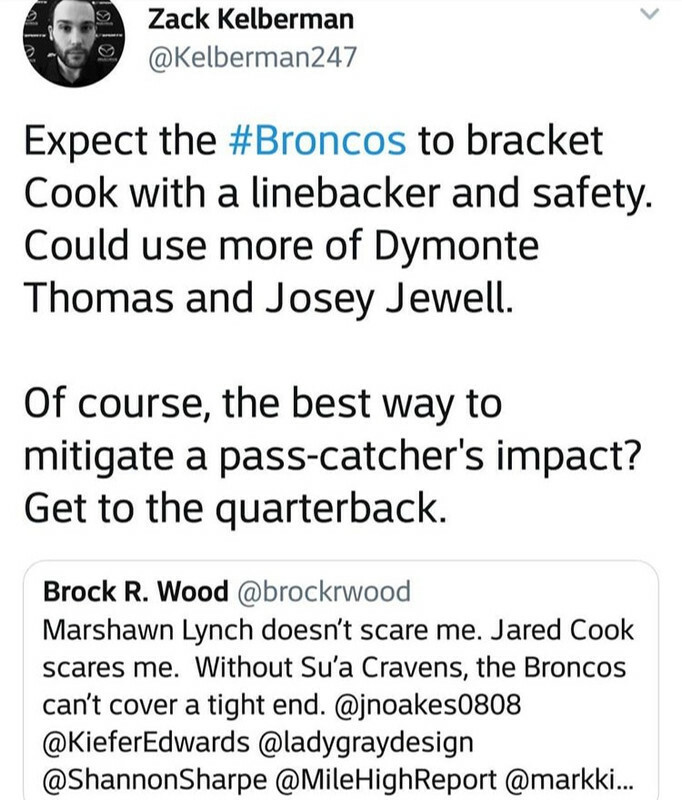 Now Keenum has to watch out for Mack... Oh wait, he doesn't. Nevermind. But Keenum does need to cleanup those bad throws and limit his INTs. 1 is acceptable, but anything more against this Raiders D should concern everyone. Last edited by Bates; 09-14-2018 at 06:26 AM. In Week 1, both of our QBs threw 3 interceptions. The differences were that Carr did not throw 3 TDs and our defense can’t make up for such horrid QB play. I saw an inspired first half followed by reality that the Raiders aren’t ready for a 60 minute battle with the Rams of the world. The Beast Mode TD run gave me hope for a competitive fight. The offense seemed to reach the end zone as a habit but couldn’t finish outside of the first drive. I’m not giving up with this new regime like everyone else is after one game. It’s a process not a game. I didn’t expect much from our defense WITH Mack before he was traded. Now I expect a less. I‘m not in the business of predicting Raider losses, so I’ll say that if they do win, it’ll be a game winning drive. Hoping for a classic. By the way, Mack had two sacks last year in a loss and 1 sack in a win. I haven’t looked up his pressures, tackles or grades yet. Raiders 23-20. CP bet for straight up wins. DS is pretty cool for a Raiders fan. Raiders looked tough first half last week and not so much second half. What team will show up tomorrow? I expect a close game and it could come down to the last play. I hope Keenum plays better now that he has a game under his belt. I predict the Broncos win in a squeaker. CP bet accepted.